Laura Bennett was the one that pronounced my jacket “too costumey” at one of the many “Project Runway” cattle calls I attended. It may have even been one of the ones for which I was sent an invitation. However, those two words were the sound of me being booted from consideration for the show because of my fashion point of view. Okay, so perhaps it was just the excuse they gave because I did not fit the type they were trying to cast. But even so, this was Ms. Bennett’s on-record reason to boot me, and it was quite odd hearing that after Austin Scarlett had loved the more outrageous work that I brought for the cattle call for season 2. Now, more than a few years out from that declaration, with an exuberant “costumey” clothing style growing, flourishing, and being generously fueled by mass market stores like Hot Topic, Thinkgeek and Living Dead (which, for my money, boasts the best quality mass-market costume dresses) I will lob a little dismissive snort off to Ms. Bennett. “Costumey” is not a dirty word. “Costumey” is a valid fashion style that is centered on expressiveness and joy. It always has been. There have been many times when fashion explored self expression more deeply. In the 60’s and 70’s we hand-embroidered our tattered jeans. We wore vests we crocheted and macrameed ourselves. We tie dyed. We sewed our little half-yard mini skirts by the dozen, and made matching purse covers out of the scraps for each one. We haunted second hand shops and dived into rag bins to rescue vintage fashion by the pound, to be put to use in a more Bohemian expression. Sometime in the 80’s we spotted starlets flitting around London in theater cast-off “HMS Pinafore” giant-anchor-themed skirts. We also swooned over Issey Miyake’s molded red plastic bustier. The 90’s came and we lusted after Thierry Mugler’s (with Mr. Pearl) over-the-top motorcycle bustier paired with leather hot pants. Later, it was his show-stopping butterfly dress that demanded our attention. So iconic was the motorcycle bustier, that we saw it again in 2009, for Beyonce’s “I AM … Sascha Fierce” album. 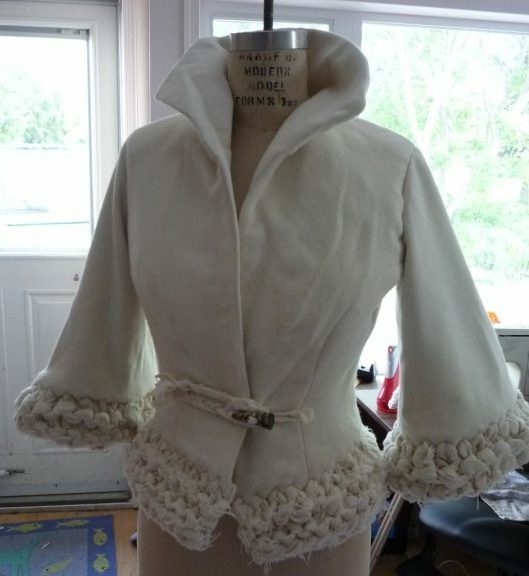 If my bland little jacket was “too costumey,” certainly these pieces, made by the masters, qualify as “too costumey.” They are by no means meant to be worn by the meek. The last time I saw the Miyake bustier in person, it was at a museum fashion exhibit. It now resides at the Philadephia Museum of Art. Is it fashion or costume? The museum says “fashion”. It gets even more recursive, considering that film costume has always influenced fashion. The most obvious example of this is the ubiquitous “T-shirt as outerwear”. We can thank “Streetcar Named Desire” for the everyday uniform of Americans everywhere. So what drives the label “too costumey”? Why is exuberant self expression met with what can only be taken as an attempt at a pejorative epithet? Why is there even a separation at all? There may be items of clothing that are not functional in the space one will be occupying, but that is not a question of being “costumey” as Ms Bennett applied the words. That is a question of engineering, and has long been a problem for even mainstream fashion. Hats, for example, must be removed at the theater, or the patrons behind you will not be able to see the show. We defined the costumes we wore to conventions as “hall” or “competition”. Hall costumes were the ones we could wear for more than 15 minutes, and they fit through doorways. In this case, “too costumey”meant you could not navigate the hotel while wearing it. Fashions that ignore the trends are held up as examples of good fashion choices. Long lasting, these garments are labeled “timeless”. We would choose these to avoid the waste of the fast turnover of fad fashions. The work of Miyake, Mugler, Mr Pearl, the unknown designer responsible for that “HMS Pinafore” skirt that found its way to street wear, were all making timeless fashion. No one would look scornfully at the Miyake bustier and say it was out of style or “too costumey”. Only its roots remain in the 80’s. Anyone who was not a student of fashion, or someone who was born after the 80’s might not even be able to correctly date it. Today we have a huge mainstream fashion trend of costume as fashion. The rise of costuming and cosplay has revealed a market for ready-to-wear street costumes, driven by the cosplay and Disneybound communities. Dresses, shirts, jackets derived directly from film, comics, and television are accepted as perfectly reasonable streetwear, and every one of them is deeply “costumey.” They are also usually centered on dresses, shirts and skirts in timeless shapes. I will venture to say that this market has always been there. One of my most timeless purchases was a 1979 “Battlestar Galactica” Viper pilot jacket, bought from an ad in the back of Starlog magazine. I still wear it, 35 years later: The utter definition of timeless costumey fashion. Today our costume fashionistas have many options. They can buy from a mass market store, have something made by a costumer, or they can make their own. There are printing houses where you can print your own art on any fabric. This way you can make whatever delights you, exactly as you imagine it. It’s these print houses that are the equivalent of embroidery and macrame we did in the 70’s. It offers unlimited self expression to this generation. My favorite print house is fabricondemand.com. They have the best customer service and best printing available. Spoonflower.com also sells its clients’ designs, and as such supports a kind of vibrant collaboration of artists by connecting maker and surface designer, no matter where they reside. As a result, fabric choices are no longer dictated by impersonal corporations. These designs, like those embroidered jeans of the 60’s, are coming up from the streets. There is no limit to the design options, and as a result they fuel allot of the current cosplay fashion scene, once called “too costumey”. And so, costume fashion is mainstream. Because of the access to short run print houses, even if the mass market shops stop selling their versions of the costume clothing genre, it will not go away. Fashion, and how we access it, has been changed by the swelling ranks of the cosplay community. Identity is strongly linked to these clothes, and it answers to the strong push for identity in the political world as well. It’s okay to wave our freak flags. It’s okay to stand out in street wear costumes. Isn’t fashion about self expression? And isn’t it amusing that those who study the history of what we wore, study Costume History? 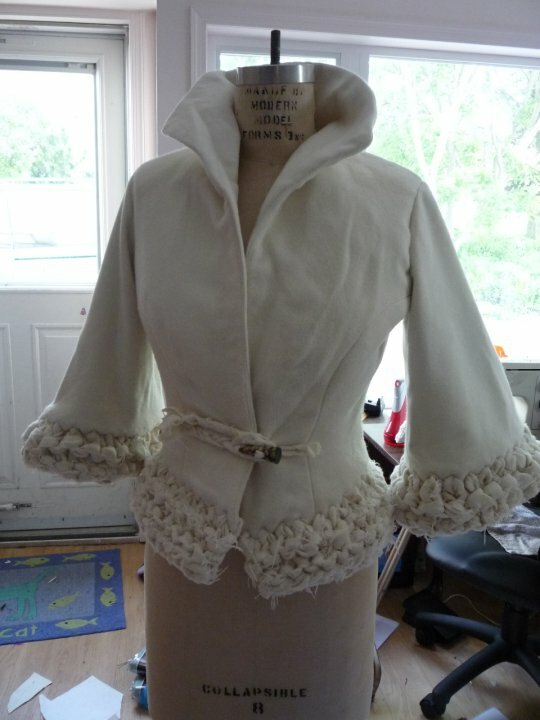 I knew what I was doing when I made my clothes, and I still think Ms Bennett was wrong to think costumey was inferior. Costumey is fashion.